How to create barcodes in Cognos using the Dynamic Barcode Generator? How can I use your Hosted Service or web component (Java Servlet) to generate barcodes through Cognos? 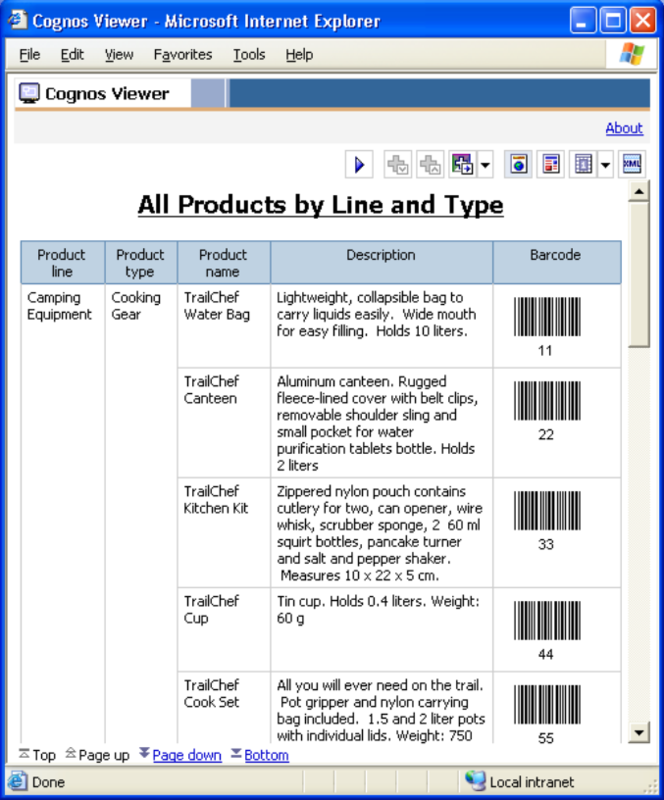 IDAutomation's Dynamic Barcode Generator Service can generate Linear, Data Matrix, QR Code, Aztec, and other barcodes in Cognos through its DataItem. The example assumes a database is already created and that the Linear barcode URL will be used to generate the barcode using fields. The fields currently include Product Line, ProductType, Product Name, and Description. An additional field, Product Number, will be converted to the barcode by setting it to the D parameter (D is DataToEncode). (1) Design the report and drag the fields to the report. (2) Click the Insertable Objects tab. (3) Drag DataItem to Report. (4) The DataItem Expression dialog will open. Enter URL (Hosted) and fields to use. product number field from the Products table. • The S parameter sets the Barcode Symbology. It is set to 1 for Code 39 Extended. (5) Click OK to close the dialog. 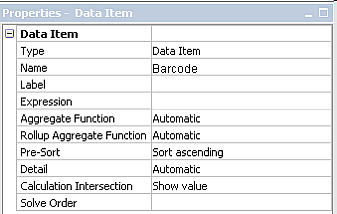 (6) Go to the DataItem properties and name the field Barcode. (7) Return to the Report page and drag the Barcode column to the report. (8) To view the report, click the run icon.